Hotel Coral & Marina on the Tijuana to Ensenada road just north of Ensenada, km 103, at 3421 Zona Playitas Ensenada. For reservations call direct (01152-646-175-0000) or toll free (800-862-9020) or (877-233-5839). Rate schedule for this 147-room, all suite hotel with ocean-view balconies is (varies). Discover an exclusive getaway in Baja California at Hotel Coral & Marina. Hidden amongst tropical lawns and swaying palm trees on the shores of Todos Santos Bay, this hotel is an oceanfront escape of unparalleled luxury in Ensenada, Mexico. Everything about this premier, modern hotel-resort and marina is first class. The suites are beautifully appointed with many modern conveniences including cable TV, HBO, air conditioning, wireless internet, and international telephone lines. Their spacious restaurants BC Bistro & Cava and Marina Grill, serve delicious lunch and dinner. They overlook the 382 -slip marina. This full-service marina with a 24-hour dock master can accommodate boats up to 120 ft. in length. They also have 2 lighted tennis courts, Jacuzzi, 24-hour security, ultramodern European-style spa offering massages, facials, steam sauna, and indoor and outdoor swimming pools. Plus, they offer an ocean-view lobby bar and nightclub Arrecife, 8 event halls to accommodate up to 500 people , professional catering and two gift shops. If you are searching for a wedding site, they offer full service at two beautiful gardens, and banquets for up to 350 people. This resort has it all! Book your room and/or events as far in advance as possible. Hotel requires a two-night stay on weekends. Located just 75 miles from San Diego, Hotel Coral & Marina is a 10-minute drive from Baja’s famous wine country, beautiful San Miguel Beach and vibrant downtown Ensenada. Our property is also home to the area’s only World-Class Marina, boasting 353 slips and shared access to the hotel’s five-star amenities. Enjoy delightful Baja-Med cuisine at our signature restaurant, BC Bistro & Cava, or try some fresh fried shrimp at Marina Grill, where guests can dine on an open-air terrace overlooking the marina. Soak up the year-round sunshine while sipping frosty cocktails in our oceanfront pool; or pamper yourself with a trip to our relaxing spa – fully equipped with a sauna, steam room, beauty salon, Jacuzzi, indoor pool and more. 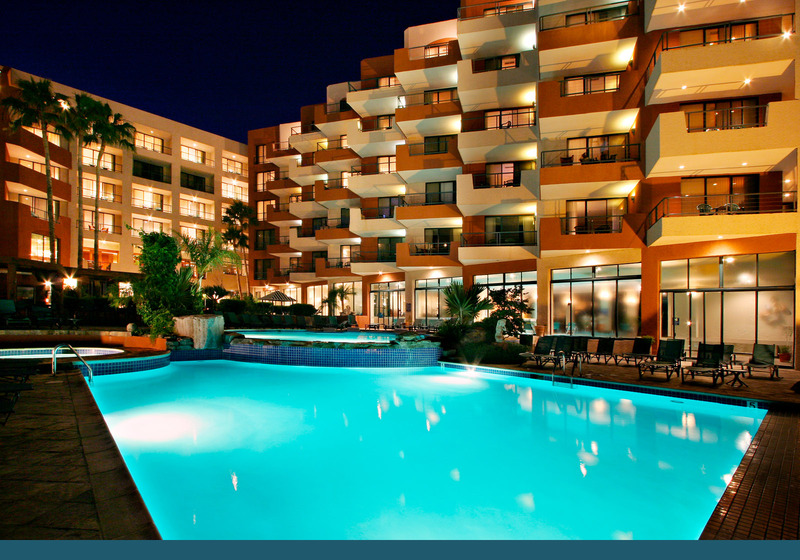 With an array of first-class amenities, such as tennis and volleyball courts, poolside bartenders and a state-of-the-art fitness center, Hotel Coral & Marina is raising the bar for service in Ensenada. Book your accommodations today, and find a new kind of paradise in Baja.